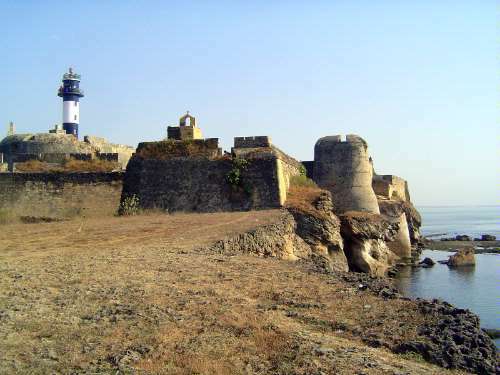 The Portuguese built a string of forts along the west coast of India, but only Diu's survives intact. 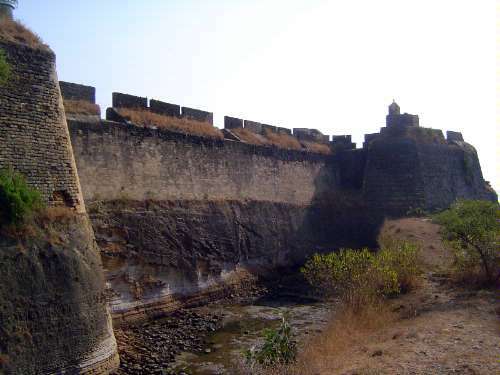 Unlike the vanished forts at Goa, Cochin, and Calicut, Diu's had and has water on three sides--all four if you count the now mostly dry moat. 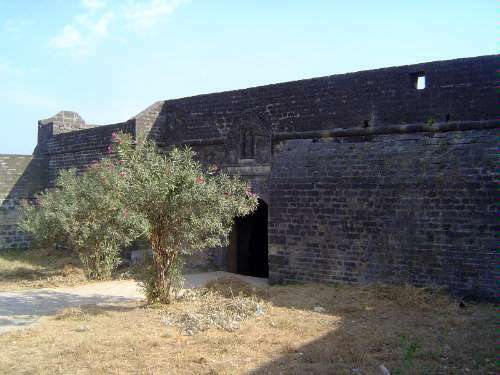 An earlier fort had been built on the site by Malik Ayaz, the sultan of Gujarat, but the Portuguese rebuilt it and soon reinforced the landward wall with a second or outer one. 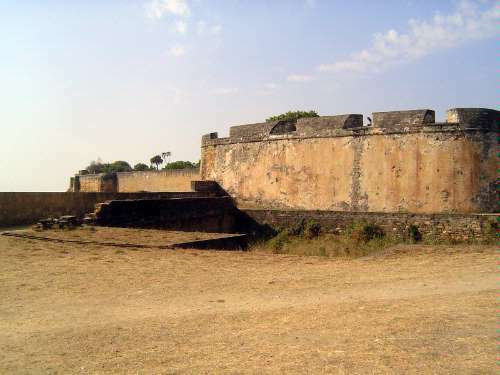 That outer wall, part of which is seen here, had three bastions. 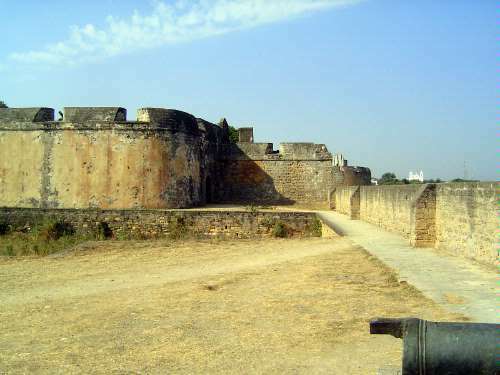 Two are visible here, each with a small chapel and each able to fire at anyone attempting to scale the wall between them. 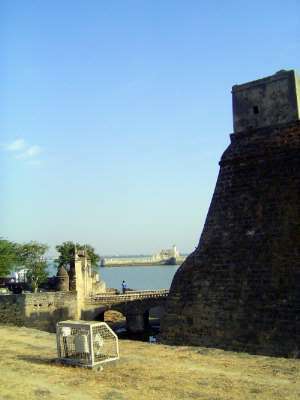 The view includes St. Dominic's Bastion on the left, St. Nicolas Bastion farther right, and the Knight's Tower, with a modern lighthouse. 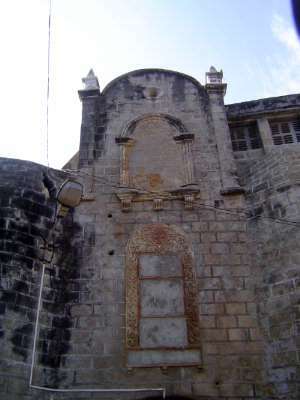 The third bastion, St. Philip'; the wall at the far right is part of St. James chapel, coming up soon. 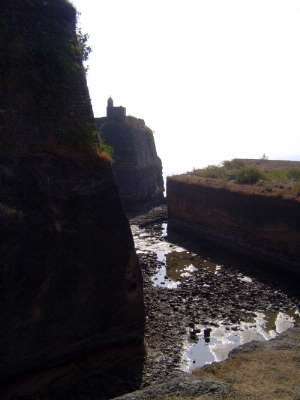 The wall was built of rock excavated to make the moat, now flooded only at very high tides. The moat winds around to the sea. 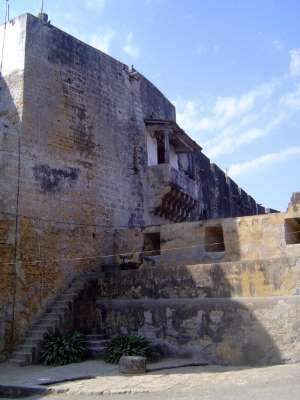 Ralph Fitch wrote in the 1580s that Diu was "fortified by an high Stone Wall with Bastions at convenient Distances well furnished with Cannon to flank it, and a deep Mote hewn out of an hard Rock." 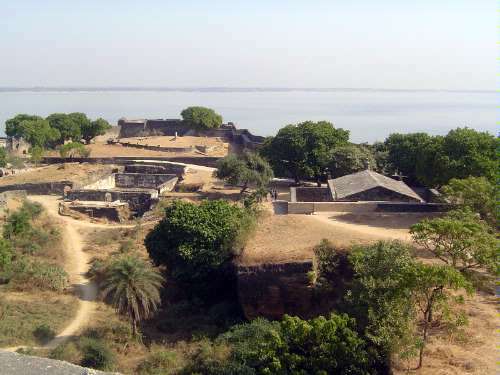 There is only one entrance to the fort, but there are two paths of approach, one by land (seen here), and one by a jetty shown in the next picture. 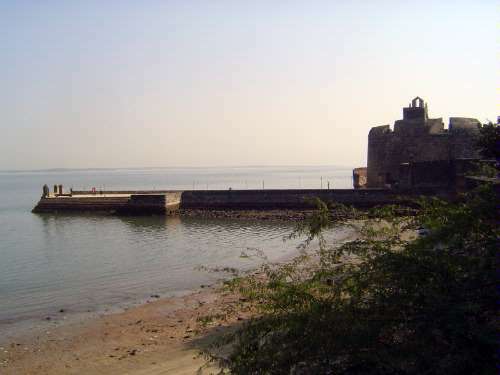 The bateria do caes or jetty, along with the St. George Tower. 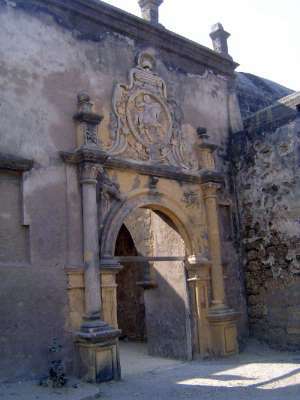 The second gate, the porta principal. 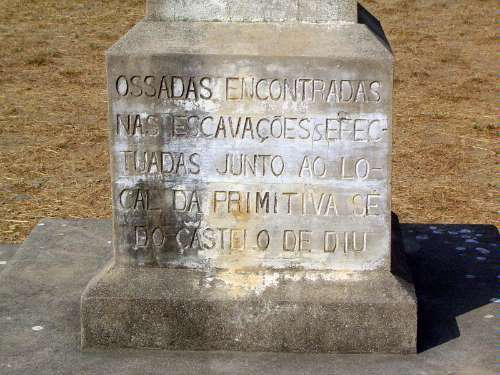 The inscriptions were a casualty of the Indian takeover in 1961, but old photos show that they were added in 1656 by order of Governor Sarmento de Carvalho. 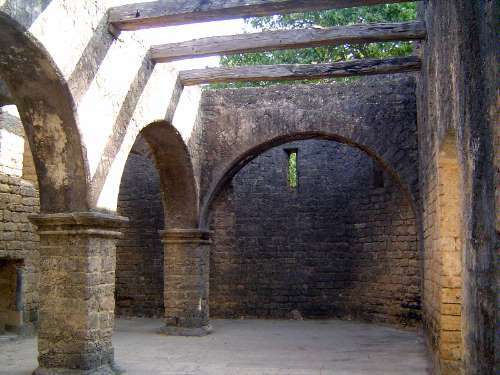 Just to the right of the main gate is a balcony, once part of the governor's palace, which was moved by 1800 to a site in the adjoining town. Old balconies have been largely obliterated. 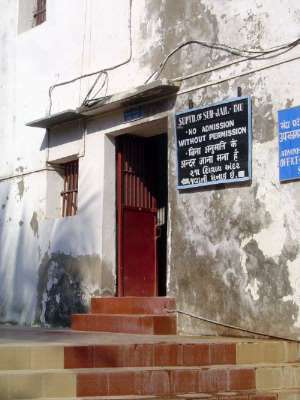 The heavy bars may have something to do with the fact that even now this part of the fort is a civil prison. Virgin and child, with angels. 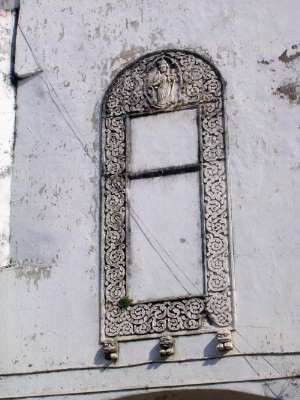 Another virgin and child in a floral frame supported by three lion brackets. The business end of the place. 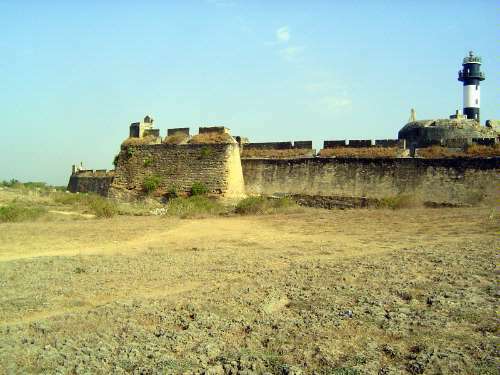 Although the fort's interior is mostly empty now, it was once a crowded place, a town in itself whose only open space was a quarry. Here, an obelisk marks the spot of the former cathedral. 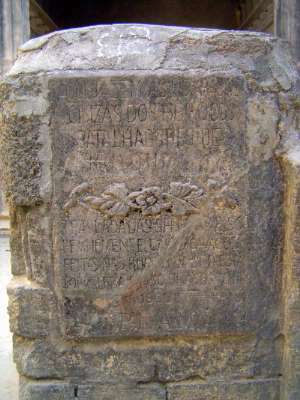 The inscription refers to bones found while excavating the site. 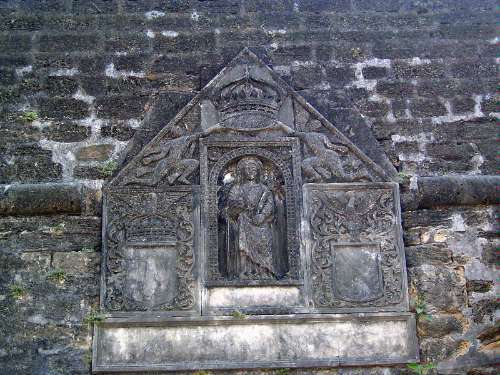 That inscription faces the sea wall of the fort. 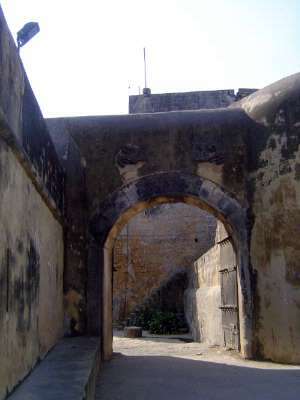 The door leads to St. Lucy's bastion. 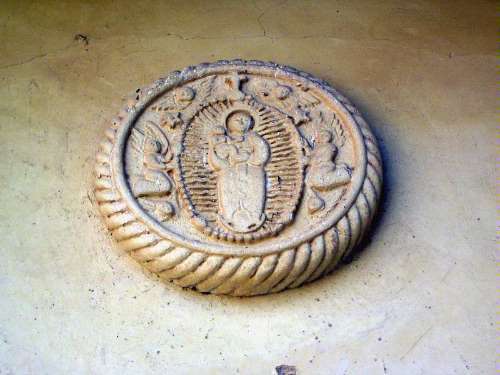 St Lucy (Luzia) stands over the passage. She is protected by angels holding a crown. 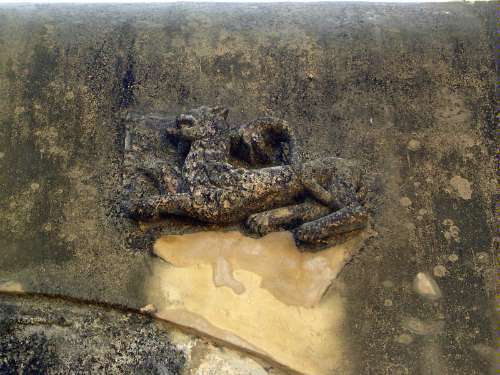 The missing inscriptions recall the date 1649 and the order of Captain Francisco Monis da Silve to build the bastion. Out on the bastion. Note the walled pit. A better view. The pit was one of many built to hold water. The cross suggests that this was a church, although the lack of windows suggests otherwise. 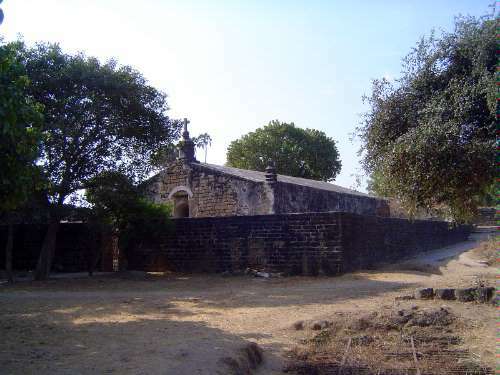 It was, in fact, a powder magazine, and its walls are over six feet thick. From the Knight's Tower (with the lighthouse) we can look down first at the quarry at our feet, then the powder magazine and, to its left, cisterns. Behind them is the site of the old cathedral and beyond it is St. Lucy's bastion. The powder magazine looks semi-buried, but the Shokoohy's write that it was not built below ground. 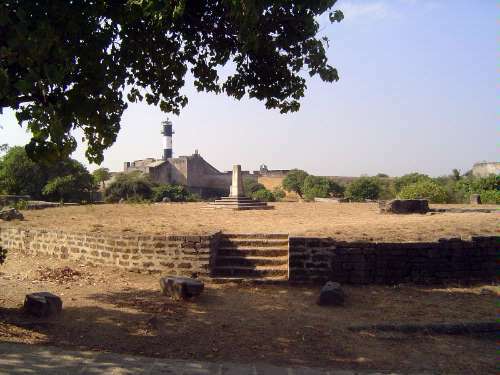 Instead, the surrounding surface has been built up by the accumulated rubble of vanished buildings. 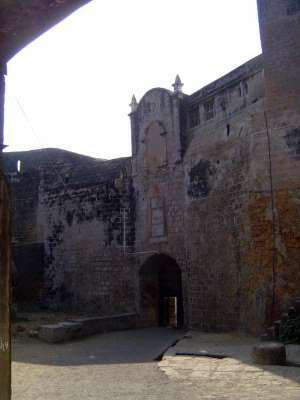 Entrance to the Santiago (St. James) bastion and chapel. 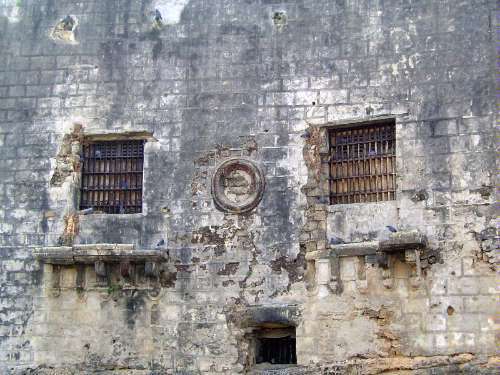 Along with the governor's palace, this was one of the two buildings maintained after 1800. Sunlight streams through the roof since the Indian Navy shelled the chapel in 1961. 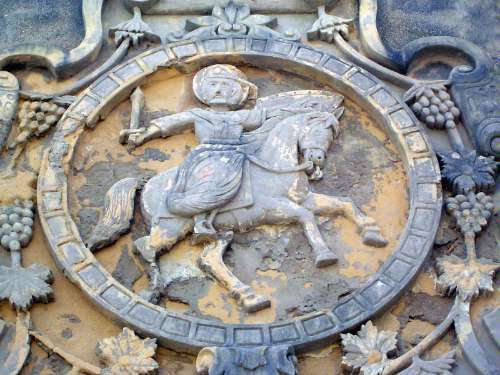 Bits of original plaster are left on the image of St. James, sword in hand as he presumably butchers the heathens. Although the roof of the nave is gone, the coffered choir is intact. 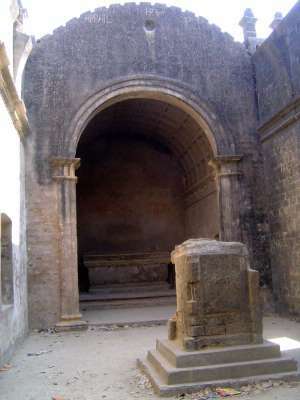 The memorial carries inscriptions copied from older ones in the vanished cathedral. It's very hard to read but was installed in 1906.